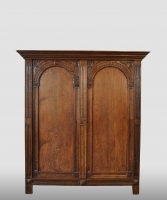 Small Dutch cupboard, 17th century. 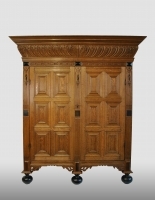 Dutch cabinet with four doors, about 1700 - 1725. Brass Nurnberg candlestick, about 1600. English dresser-base with five drawers, about 1750. Dresserbase with three drawers, mid 18th century. 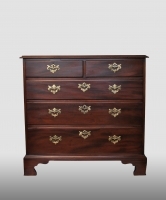 English dresserbase with five drawers, lateb 18th century. 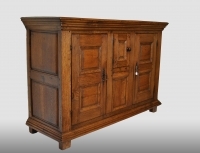 English dresser base with three drawers, oak. English mahogany dining table, about 1850-1875. 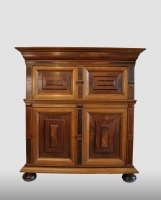 English potboard dresser, 18th century.